You who are faint of heart, stop reading now. I thought that Penumbra was a strong contender for the top spot on my horror list, but Frictional Games have since outdone themselves and produced Amnesia, premium quality, high-octane nightmare fuel. Taking a common plot device (amnesia) and running away with it (into a dark wood) has never been so effective, and it’s no exaggeration to say that this is the scariest game I have played to date. People–and the game itself, in fact–will tell you to play at night with the lights off. Well, even with the lights on, I was still terrified. Heck, to this day, I can’t look at a picture of a Grunt for more than a few seconds without wincing. Everything that Penumbra did right is reused and amplified in this game, from lack of combat to unreliable perception. The interface is largely the same (first-person view, hand cursor and physics engine), as is the menu. The game is set in XIXth century Prussia, in the foreboding Brennenburg Castle, situated in the middle of a forest. You are put in the shoes of Daniel, a young Englishman, who wakes up, confused and disoriented somewhere in the building. He can barely remember his name, and yet he must make sense of both his surroundings, which are anything but reassuring or safe, and his situation, which is downright horrifying. You discover snippets of Daniel’s history from short texts on loading screens, but also through flashbacks, letters and diary entries strewn throughout the castle…which he has left for himself. Apparently, his amnesia is self-inflicted and voluntary, and if you’re wondering what could possibly have driven him to such an action, well…play and find out. I’ll just say that he was involved in an ill-fated archaeological expedition, and it was all downhill from there. Daniel is one of the game’s best assets as a channel for fear, because saying that he has a fragile psyche is an understatement. Philip, his predecessor from Penumbra, could panic if staring directly at an enemy for a while. But compared to Dan, that makes him a paragon of stoicism. And where Phil was a gasper, Dan’s a professional whimperer. He whimpers like a boss. This is especially striking when compared to his normal, somewhat gruff baritone, showcasing just how much of a wreck he has become. Dan’s other defining characteristic is his severe nyctophobia. Just walk him through a dark corridor, and you’ll see what I mean. The screen will start distorting and blurring, and you’ll hear the unnerving sound of grinding teeth. Should he remain without a light source for long enough or witness one horrifying event too many, hallucinations may kick in. Those could be bugs crawling across the screen, imaginary corpses or a portrait distorting into a nightmarish vision (this is a particularly nasty one). That, or he will start talking to himself. This is a system most likely inspired by Eternal Darkness: besides his health meter (indicated by a human heart on the menu screen), Dan also has a sanity meter (indicated by a brain and spinal cord). You can increase it by solving puzzles or stabilise it by staying in the light, but its natural state, so to speak, is a steady downward curve. Should it ever deplete completely, Dan will have a nervous breakdown and collapse on the floor in a gibbering mess for a few seconds, before getting back up with a hit to his health. The problem is that if this happens when an enemy is nearby, he might as well be blowing a foghorn. To make matters worse, since Dan can’t fight, his only recourse when faced with a hostile is to cower in a dark corner until it lumbers away. Except that, with his condition, you better hope that it happens quickly. This makes for some particularly tense moments, and a crucial issue in the game is balancing the amount of ambient light: enough to keep Dan decently lucid, but not enough to make him a sitting duck. This is compounded with the fact that both of his light sources are limited. Where Phil had his trusty, inexhaustible glowstick, Dan has an oil lantern–and available oil refills are scant at best–and some tinderboxes, which he can use to light candles or torches. The other commodity in short supply are laudanum vials, which are used to recover health. Another clue, if you needed any, that you need to avoid damage as much as possible. Enemies…oh god. The most common type–and, unfortunately for me, the one I find scariest–is the Grunt. Affectionately dubbed ‘Mr Face’ by the fanbase. This should clue you in as to the most distinctive part of its anatomy. And I’ll leave it at that. If you want a clearer image (think very carefully before deciding), look here. I just don’t want this thing staring back at me every time I look at this review. *shudders* Although, your mileage may vary: some people find the Brute, which shows up in later levels, scarier. It’s certainly more deadly, as it will usually down Dan in one hit, whereas he can weather a couple of Grunt slashes. The third enemy goes by the uncouth moniker of ‘Kaernk’ (an anagram of “kraken”, as it’s a water-dwelling critter) and…it’s invisible. To some, that’s even more terrifying than visible monstrosities. Fortunately, it’s the rarest enemy of the three. Unfortunately, the sequences involving it are pretty harrowing. There’s one other hostile out for Dan’s blood, but I’ll leave you to experience that one for yourself. There are three endings to the game, and while one of them is indisputably bad, it’s a toss-up as to which of the other two is the best. Up to you to make up your mind, but there’s certainly food for thought involved. The other positive aspects are the graphics and the music, composed by Mikko Tarmia, who already worked on Penumbra. Where the former game had that gritty, semi-industrial feel to it, Amnesia is unabashedly gothic, with wooden furniture, thick red curtains and carpets, and old stones dimly lit by flickering candlelight. 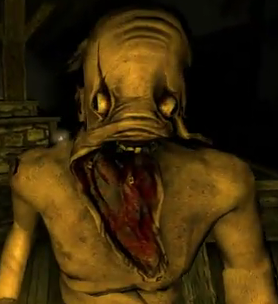 An old castle is a perfect setting for horror, and Amnesia is more pleasing to the eye than its predecessor. Especially the Back Hall…at first. The Back Hall also features my favourite piece from the game’s soundtrack, a surprisingly calm, solemn and soothing track, which contributes to giving the place a temporary aura of safety. The rest of the soundtrack is none too shabby either, successfully upholding a creepy, gloomy atmosphere, with some disturbing sound effects interspersed with the music. Several months after the release of the game, an expansion titled Justine saw the light of day. While it’s also set in the XIXth century, it bears no relation to Daniel’s story (or a very tenuous one), and features a different protagonist–amnesia being the only common characteristic–and a very different perspective on things. The goal this time is to find a way through a series of psychological ‘tests’, set up by Justine, a French noblewoman, who is a sadistic sociopath (it’s no wonder she’s named after a book by Sade). You find yourself in her Cabinet of Perturbation, and she guides you via a series of phonograph recordings she has left behind. It’s a shorter experience than Amnesia, but no less intense. There’s still no combat and only three enemies, but they all used to be Justine’s suitors…before she decided to experiment on them: Aloïs, the tennis player, Basile, the carpenter, and Malo, the violinist. Each represents a different kind of ‘love’ and exhibits the corresponding personality: Aloïs is needy and devoted, Basile is rough and abusive, and Malo is passionate and…well, insane. And if I were in their shoes, I’d probably swear bloody revenge on Justine as well. Justine is also made significantly dicier by the inability to save. Your character dies, you start over from the beginning. And considering that there is an excruciatingly difficult chase sequence towards the end, the likelihood of having to start over is a very real one. So if you become frustrated after being repeatedly mauled, like I did, you may consider installing a mod which implements saving, fittingly titled “Softcore Justine”. This problem aside, I did enjoy this storyline for its difference in tone. It even has a chilling twist ending. Special commendation goes to the profoundly unsettling messages on the wall of the mazelike Crypt corridors (“death shall move across the floor” gave me a hearty wave of goosebumps) and to the adrenaline-charged music which plays when a Suitor gives chase. Still gives me a jolt when I hear it. All in all, Amnesia is a heck of an experience. There is room for improvement, such as randomising enemy encounters, which are currently scripted and therefore lose some impact after the first playthrough, but don’t let that deter you. It would just be the cherry on top of a deliciously terrifying cake. If I had to recommend one horror game above all others, this would be it. But I decline all responsibility for any involuntary yelps, screams, nightmares or sudden trips to a different room which may ensue.